The Social Science Research Commons, in partnership with UITS, provides access to the Restricted Access Data Remote Server (RADaRS). RADaRS is for researchers who wish to obtain, store, analyze and conduct research with data sets that must be used only within a secure environment. This website described the basic parameters of the servers and the steps necessary for establishing projects within the server. At this time, all services are available at no charge to the individual researcher. 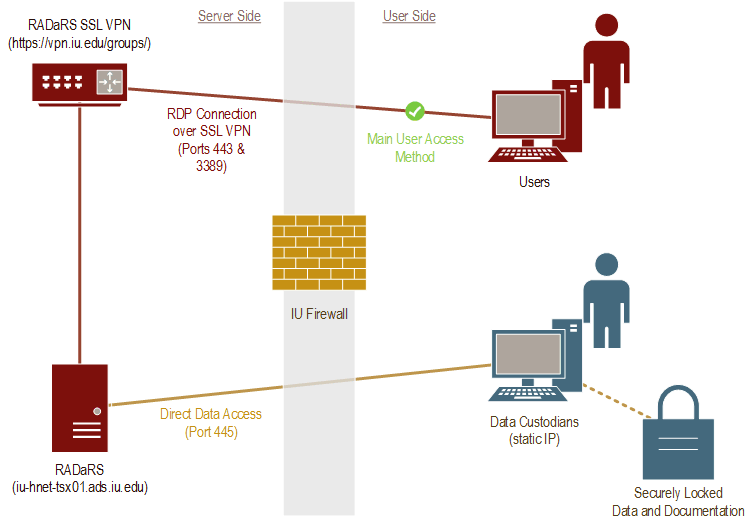 The Restricted Access Data Remote Server (RADaRS) is a secure research hub for all areas of social sciences and beyond, enabling a data custodian to upload secure datasets, while restricting researchers to do the analysis alone, remotely from their desktop workstations or laptops. Other restrictions are in place (e.g. : require specialized VPN connection, inability to browse the web or transfer any kind of data manually, inability to copy/paste/print to or from the server) so that the researchers may work in as secure a computing environment as possible. A wide variety of software programs, such as SAS, SPSS, Stata, R, Microsoft Office, and more are provided for usage on these servers. With all of this in place, researchers are able to get some of the most crucial datasets from some of the most prestigious data providers in the country, all while working on them from the secure location of their choosing.